construction of the hockey rink. Photo courtesy Jan Hrabal. After weeks of speculation, the APK, HC Eaton Pardubice and HC Kometa Brno announced today at a press conference and via their respective websites that they will, indeed, stage an outdoor game at Pardubice-Svítkov Speedway on January 2. The event, which has been titled "Hockey Open Air Game 2011", will feature Eaton Pardubice hosting Kometa Brno in a Tipsport Extraliga game beginning at 12:30 PM CEST (11:30 AM GMT, 6:30 AM EST). It will be preceded by a legends game between past members of the Pardubice and Brno clubs, which will begin at 10:00 AM local time. The stadium, which sits in the Svítkov district of Pardubice, hosts the famous Zlatá přilba or "Golden Helmet" motorcycle race every October. The ice rink will be constructed on the circuit's grass infield. Its planned configuration for this event would allow for more than 25,000 spectators; 17,000 seated and another 8,000 standing. If filled to capacity, which is expected, it would become the largest recorded crowd to watch a hockey game in the Czech Republic. The current record stands at 18,500, for the grand opening of Prague's Sportovní hala (now TESLA Arena) in 1962, in which Spartak Sokolov hosted ZKL Brno. Pardubice General Manager Zbyněk Kusý, who has also been part of the organisation teams for two World Junior Championships held in Pardubice, says that preparations to the stadium will begin on December 9. It is expected to cost 15 million Czech crowns (roughly USD 790,000) and require 700 workers. The only player on either team's roster who has participated before in a high-level outdoor game is Pardubice forward Rastislav Špirko, who played for Slovakia in an international friendly in Switzerland in February 2009. Two American players, defenceman Jeff Jillson and forward Adam Pineault, currently play for Pardubice. Jillson played his last game for the University of Michigan seven months before they played an outdoor game against rival Michigan State in October 2001. Tickets, which range from CZK 450 to 1000 (approximately USD 24 to 53) go on sale December 6 at the ČEZ Arena box office in Pardubice. For those fans abroad who might want to make a trip to see this event in Pardubice, requests can be made via e-mail to mirek.novotny@hcpce.cz beginning December 1. 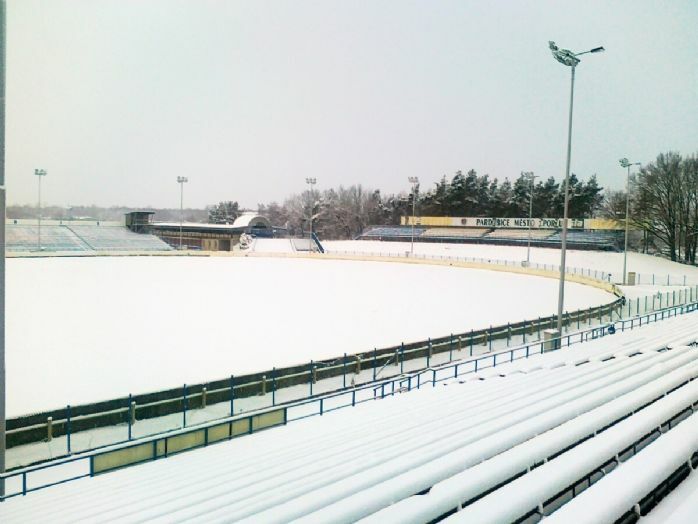 This will be the first professional outdoor game in the Czech Republic, but not in Europe. Leagues in Sweden, Switzerland, Austria, and Russia have already hosted games outdoors, and one is scheduled for Finland in February.